When I first arrived in North Philadelphia as a community volunteer in the mid-1990s, I was struck by how noisy the place seemed to me, in contrast to my upbringing in rural Minnesota. The windows of my brick row home rattled and buzzed with the passing of cars blasting the salsa rhythms of Me Tengo Que Ir and the pulsating bass of Notorious B.I.G.’s Hypnotize. During the warm summer months, outdoor worship services added to this acoustic cacophony. It was a common practice for area Pentecostal churches to set up amplifiers and speakers on street corners, particularly in locations known for the sale of heroin. The multi-hour services included dozens of coritos sung by exuberant vocalists (often singing significantly off-key) and accompanied by electric guitars and tambourines. Following the music, a flamboyant preacher called all of those under the spell of his microphone to repent of their sins and follow Jesus. The drug dealers on the corner did not welcome such sonic interruptions to their narcotics sales and they turned up their stereos even louder. As the worship service reached a fever pitch prior to the altar call, this aural contest would reach ear-splitting levels. For the Pentecostal street preachers, turning up the volume was the means by which they proselytized the community. In this instance, it wasn’t the content of the religious speech that was most important. The services were conducted in Spanish, but most of the youth targeted by the church members spoke only English. Nonetheless, the church’s occupation of the sonic landscape (sonicscape?) for a few hours on a summer evening symbolized to many the presence of God. As Isaac Weiner points out in Religion Out Loud, making noise is not merely a vehicle for religious groups to convey their messages. Rather, for some, it constitutes religious expression in and of itself. Civil authorities in the U.S., however, have not typically embraced this understanding of religion, especially when religious sounds made by some intrude on the preferences of others. Weiner describes the case of a Jehovah’s Witness named Samuel Saia, who in 1946, affixed a loudspeaker to the roof of his Studebaker and positioned it in a public park in Lockport, New York. He permitted preachers to amplify their sermons to a crowd of picnic-goers. Chagrined by this auditory intrusion, Lockport residents contacted the police, who arrested Saia for operating loudspeakers without a permit. Saia managed to get his case heard by the U.S. Supreme Court and claimed that the Constitution’s guarantees of religious freedom ensured his right to make noise. The Supreme Court sided in favor of Saia on the grounds that the city of Lockport did not have a consistent policy on issuing permits for public speeches. However, the decision said nothing about Saia’s claims about the free exercise of religion. The court understood the Witnesses’ sermons to be no different than any other form of public speech. Weiner demonstrates that since the late nineteenth century, U.S. courts have most often concluded that religious sounds do not deserve special protection. Residents near St. Mark’s Episcopal Church in Philadelphia’s posh Rittenhouse Square neighborhood complained that church bells interrupted their sleep. The church, however, claimed that daily bell-ringing was a vital part of its ministry to remind passersby that God was present throughout the week. In the Pennsylvania Supreme Court case Harrison v. St. Mark’s, the judge argued that church bell ringing was a valued part of life in the city, but the particular bells at St. Mark’s were too loud. Basing his decision on property rights, the judge maintained that the sound of church bells need not be eliminated from public spaces, but they were subject to regulation if they were a nuisance to neighbors. By the twentieth century, civic officials used the science of measuring sound in decibels to ensure that all urban noises, including religious noise, would be subject to the same criteria for determining whether or not it was a nuisance. Still, as Weiner argues, “treating everyone the same is not equivalent to treating everyone equally.” In legal decisions such as Harrison v. St. Mark’s, there appears to be a bias that privileges quiet and contained religious expressions, but shuns those that are boisterous and disruptive. Weiner’s book reminds us that “complaints about religious noise are rarely just about noise.” At particular times and in particular places, religious sounds can blend into the acoustic rhythms of a city and become unnoticed. Yet in other times and places, those same religious sounds stand out and are categorized as “noise.” While living in North Philadelphia, I hardly paid attention to the sound of clanging church bells emanating from the local Catholic Church, even when they rang for early-morning mass. The decibel level, however, was arguably as high as the Pentecostal church services that seemed so “noisy” to me. As Weiner observes, the religious sounds that are not noticed are the ones that wield the most social power, because they are taken for granted. The final case study considered in Religion Out Loud is the 2004 request by the al-Islah Islamic Center to the city council of Hamtramck, Michigan, to broadcast the adhan—the Islamic call to prayer—from the loudspeakers of the mosque. Hamtramck had long been a bastion of Polish Catholicism and the ringing of church bells was a ubiquitous part of the auditory landscape. And yet, the possibility of a publicly-audible Islamic call to prayer raised the ire of long-term residents. In a series of well-attended and highly-contentious meetings, Hamtramck’s residents debated a proposed noise ordinance that would permit the broadcasting of the adhan. Weiner identifies “three distinct rhetorical positions” deployed during the debates. The exclusivists saw any accommodation to religious minorities as a threat to notions of a “Christian America.” Those advocating privatism argued that the public sphere was secular and “religious differences were best kept quiet.” The pluralists argued that public spaces ought to reflect a diversity of religious sounds. In the end, the city of Hamtramck voted to permit amplification of the adhan and pluralists interpreted it as a symbol of interfaith toleration that called all religious people to pray. Weiner is cautious to praise the triumph of the pluralists in the Hamtramck case due to their tendency to erase the distinctiveness of the Islamic call to prayer. Religion Out Loud levies some important critiques of the liberal rationale that often informs religious pluralists. 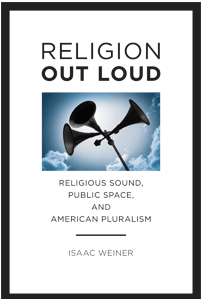 As such, Religion Out Loud has been a welcome addition to my Religion and American Culture reading seminars and pairs nicely with selections from Diana Eck’s A New Religious America: How a “Christian Country” Became the World’s Most Religiously Diverse Nation. While Eck demonstrates and celebrates the development of religious diversity in the U.S., Weiner’s book more clearly outlines the power dynamics at play in conversations about religious pluralism. He also illuminates the biases in U.S. legal discourse about the place of religious sounds in public. Overall, the book was well- received well by my graduate and undergraduate students. In one learning exercise, I divided the students into three groups representing the three approaches to religious diversity outlined in the book and asked them to re-enact a Hamtramck city council meeting. Quite appropriately, it was a beautifully-raucous class session. As a final exam question, I asked students to use Religion Out Loud to write up a report advising the mayor on how to develop a noise ordinance that respects what the U.S. Constitution says about religion and takes into account the changing religious demographics of the city. In sum, Weiner’s engaging writing style, careful explanation of case studies, and important critique of the orthodoxies of religious pluralism will likely make this book appealing to students and scholars for years to come. ← Viking Artifacts Discovered Near Great Lakes! !